While you can mix in whatever your little heart desires, I opted for a primarily pig-prominent selection. Ham and bacon combined with some scallions for color and pepper jack cheese for heat is a combination unsurpassed in excellence for me so far. Other killer combinations include apple, cheddar, and thyme or sausage and swiss. Once again, you're limited only by your imagination. As quick, filling, and delicious baked breakfasts go, these scones are the cat's meow! Combine the dry ingredients and cut in the butter until a coarse, crumbly mixture is formed. Mix in the milk, beaten egg, cheese, bacon, ham, and scallions using a fork just until everything is moistened and then turn the batter out onto a floured surface. Form into an 8-inch wide disk. Apply an egg wash and sprinkle with salt and pepper, then cut the round into 8 wedges. Transfer to a baking sheet and bake for 15-20 minutes. Those savory scones are wonderful and your kitty is really cute! Primarily pig is my favorite way to go. Oh my - these scones look fabulously savory and delicious! Yum! I don't think I've ever encountered a super awesome scone in my life...they really almost always are dry! I'll have to try this version....and make up for all the bad scones I've had in my life. Of all the scones savoury ones are my favourite. Throw in some cheese and I am happy. Ahhhhh , your cat is adorable! Love the way he is laying, with his back legs out!!! And the scones look divine too with all the Pigness! I love all the savory goodies you added to these scones! I've made bacon and cheese scones and they were yummy, but yours will be over the top delicious with all the extras......very good Grace! And I love your kitty...makes me miss having one. Never! Cannot begin to tell you how incredible these bad boys look. My sons and would crush 'em. I've never seen anything like these before! So often, Scones are dry and crumbly. I can appreciate yours bc you can just tell they're soft and moist! and then, with ham AND bacon? That's outta this world!!! They look super moist and fluffy, definitely something I would enjoy! I'm not sure which I like more: cats or scones! I am a pig LOVER.....These sound amazing,Grace! I would a dozen of those! 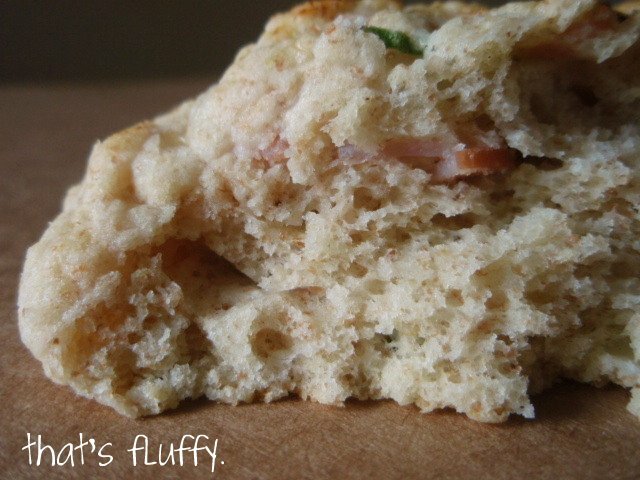 I like the idea of savory scone...they sure look light and fluffy...beautiful texture Grace. Now these look like some amazing scones!! Love that fluffy texture...and how customizable they are! I have the cold and not enough bread flour to make a much needed loaf. You have saved me from going out. In my oven right now are cheese and apple bannocks (Scottish word for a round of dough/it's wedges). Thank you! Pig is likely high on everyone's favorite food list, and these scones look terrific. I hope you shared with that poor, starving kittycat! I need more savory scones in my life! The apple cheddar combo is something I bet I'll be baking soon. 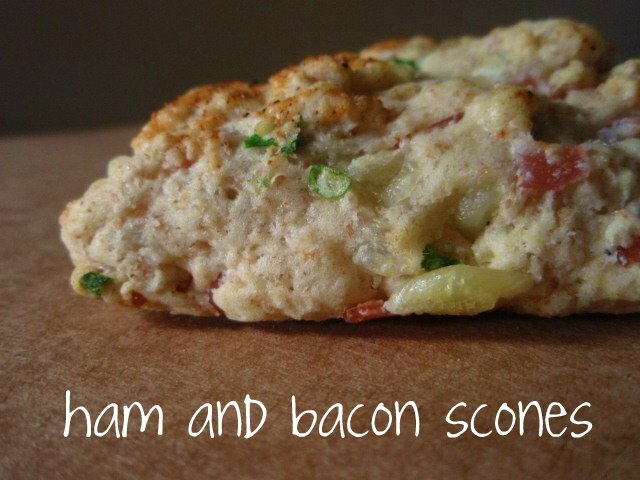 Oh I love savory scones - how fabulous with ham and bacon! Nope- those look so good- definitely not dry. I am so glad you are seeing the light of the scone. Dude- you really need to try my maple ones. They are so good. Well, not mine, Crescent Dragonwagon's to be precise. They are so creamy and delicious. They come from the book- The Cornbread Gospels. I love your little kitty pic! These savory scones look fantastic Grace! Once more you're inspiring to try my hand at baking some bacon! Pig prominent selections are the best kinds of selections! I've made a few kinds of sweet scones, but never savory. These look amazing, and I love the apple, cheddar and thyme variation too. Fun! And I made some bacon and cheese scones last week. I'm loving the savory scones. Yours look so much lighter than mine....wonder if the cheese makes the difference? These look awesome. Funny, but my post going up tomorrow has savory muffins, which John and I loved but were just too weird for my kids. A shame, I am betting these would be too and they look DELICIOUS! WHat new shows are you excited for? They look amazing! Why haven't I thought of savory scones?? The cat photo is so cute. Gorgeous scones and adorable cat! This looks like a scone I would actually like. they are usually way too DRY for me! And bacon . . . come on, what's not to like? I'm definitely a pig lover! Love scones too so these are perfect! Savory scones--what a great idea! 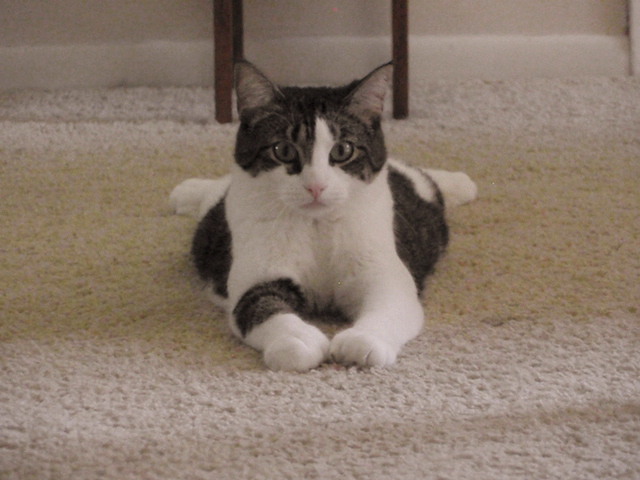 And you cat is darling, looking so dignified in the silliest pose. Scones salados que delicia sabrosa una tentación...lindo su gato yo tengo una gata negra de 18 años podrían hacer pareja,jejej,abrazos hugs,hugs. I have never tried a savory scone. You have my attention. These look awesome. A savory piggie laced scone~~ yummy! !